How will you get the electric pet fence around my property? What is the average time needed to train a dog? The training time varies with each dog and each trainer. On average, our safe and gentle training program takes about 10 minutes two to three times a day for 2 weeks to train your dog. Some dogs learn within just a few days. Will the correction harm my dog? NO. The mild correction that your dog feels is designed to be undesirable so your dog will avoid it, yet is totally harmless and humane for dogs down to 5 pounds. Our systems give the dog an audible alert BEFORE a correction is received. Your dog will quickly associate the audible alarm with impending discomfort, so he or she will soon understand where the boundaries are. Will this system work for all dogs? With a success rate at over 99.5%, almost all dogs can be successfully trained to stay safely in their yard with our systems. There are a few breeds or circumstances that may need special consideration. We will discuss your situation with you before we begin any installation. How old should my dog be before using an electronic device? It depends on the dog. This can be discussed during the initial consultation to make sure we consider the specific circumstances to determine what is best for your dog. Will the installation damage my lawn? Absolutely not. When we complete the installation, you will have a hard time determining where the wire has been located. We use specialized equipment designed specifically for laying the wire without any damage to your lawn. A very thin groove is made in your lawn to bury the wire. The groove is covered up before we leave. Is Colorado Pet Fence the same as Invisible Fence®? Every week we get several calls from people asking us if we can give them a quote on an Invisible Fence® for their dog. We want to be clear, we are not an Invisible Fence® dealer, Invisible Fence® is a trademarked name that refers to a specific company and product. Colorado Pet Fence sells electronic pet fencing that is similar to what is sold by Invisible Fence®, but we use products with a higher level of technology that provides significant improvement and cost savings for the pet owner. We DO often have used Invisible Fence® collars and other hardware for sale to dog owners in Colorado. How does your company compare to Invisible Fence®? We are an independent local company servicing the Denver Area Front Range and Mountain Communities. We service all brands of electronic pet fencing in the Colorado area, including Invisible Fence®. The Buyer’s Tool effectively points out the differences in our products and services. The most notable difference is our rechargeable collar with a lifetime warranty. Invisible Fence® is a large nationally owned company that has been around for many years. They are part of a conglomerate that also owns, Petsafe® and Innotek®. The Invisible Fence® portion of this conglomerate has a dealer network that sells a collar that requires batteries to be replaced every 3 or 4 months. Does it make sense to switch to a Colorado Pet Fence if I already have an Invisible Fence® system? It depends. Because of the expensive battery requirements of most other systems and our generous buy-back program, it actually makes sense to switch in most cases. The one-time cost for switching over is soon paid back to you because you no longer have to buy expensive batteries (at $16 each – every 3 or 4 months). The more dogs you have, the more quickly this payback occurs. Often, in less than 3 or 4 years, you will be ahead of the game financially by letting us upgrade your system to a Colorado Pet Fence system. With four dogs or more, that payback time is less than 3 years! In addition to the cost savings – you will get several other features that will be a step-up from what you currently have. If you are adding a new dog to your pack – the payback is almost immediate because of the high price that Invisible Fence® charges for a new collar. It’s a “no-brainer” to switch from Invisible Fence® to a Colorado Pet Fence in this situation. There are other companies that sell a similar product, why should I choose Colorado Pet Fence over the others? All the companies in our area share the same basic technology that was invented by Invisible Fence® many years ago. Each has a good product and will help you keep your dog safe. We truly believe that each company operates with the well being of your pet as their top priority and each of them have an effective product. So, your choice comes down to finding a company that you trust and that offers you the best overall value. Colorado Pet Fence has the best guarantee in the industry and we will save you hundreds with our rechargeable collar system. Can more than one dog share the same system? Yes. You will only have to purchase additional collars. My dog is jumping over or digging under our existing physical fence. Will a hidden fence keep him within our fence? Absolutely. A large percentage of the installations we complete are for pet owners that have an upright fence in their yard already and the dog has figured a way out. It is very common in communities with HOA’s that require a low, split-rail fence. We can stop your pet from escaping the fenced yard. Guaranteed! Don’t these systems get expensive when you consider the cost of battery replacements? No. Most of the collars that we sell have built-in Lithium Ion batteries that never need replacing. The collars are designed to possibly last the life of your pet — all you have to do is recharge the battery when indicated. The system will notify you when the batteries need to be charged. So, YES, batteries are expensive. 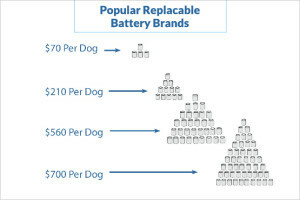 But with Colorado Pet Fence you don’t need the huge expense of replacement batteries. You save lots of $$$ with our rechargeable dog collars. • Green for the environment + More green in your wallet! How will I know if my collar is charged and working correctly? Our collars are unique in that they have a status light that will blink green when your collar is charged and working properly. Most other systems being sold either have no light, or they have a “low-battery” light which only flashes for a few days when the collar is really low, then stops flashing when battery is completely drained (leaving you a 50-50 chance of the collar working if the light is not flashing). With our collars, you’ll always know for sure when you see the green light. 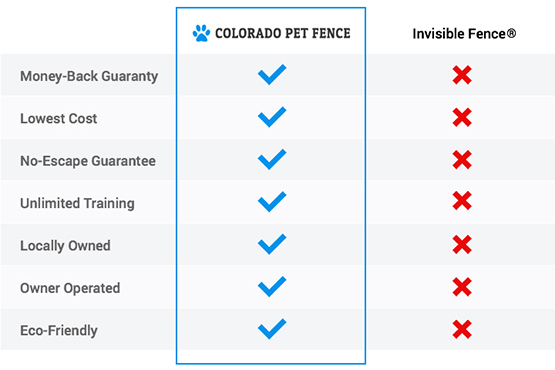 Does Colorado Pet Fence service Invisible Fence® systems in the Denver Area Front Range and Mountain Communities? Yes. We can repair any type of electronic pet fencing system in the Colorado area. We service Invisible Fence®, DogWatch®, Dog Guard®, Pet Stop®, and even self-installed systems. Denver, Littleton, Aurora, Black Forest, Highlands Ranch, Cherry Creek, Centennial, Parker, Castle Rock, Castle Pines, Perry Park, Evergreen, Morrison, Sedalia, Monument, Colorado Springs, Palmer Lake, Franktown, Elizabeth, Kiowa, Pueblo, Woodland Park, Cripple Creek, Thornton, Erie, Lafayette, Windsor, Ft. Collins, Boulder, Westminster, Arvada, Broomfield, Golden, Englewood, Brighton, Ft. Lupton, Longmont, Berthoud, Greeley, Canyon City, Grand Junction, Fairplay, Buena Vista, Aspen, Vail, Beaver Creek, Craig, Steamboat Springs, Salida, Leadville, Twin Lakes, Gunnison, Telluride, Crested Butte, Snowmass, Durango, Pagosa Springs, Estes Park, Bailey, and Conifer. Most other systems have expensive battery costs and our generous buy-back program, it actually makes sense to switch in most cases. The one-time cost for switching over is soon paid back to you because you eliminate expensive batteries every 3-4 months. Those batteries start at $16 each. The more dogs you have, the more quickly this payback occurs. 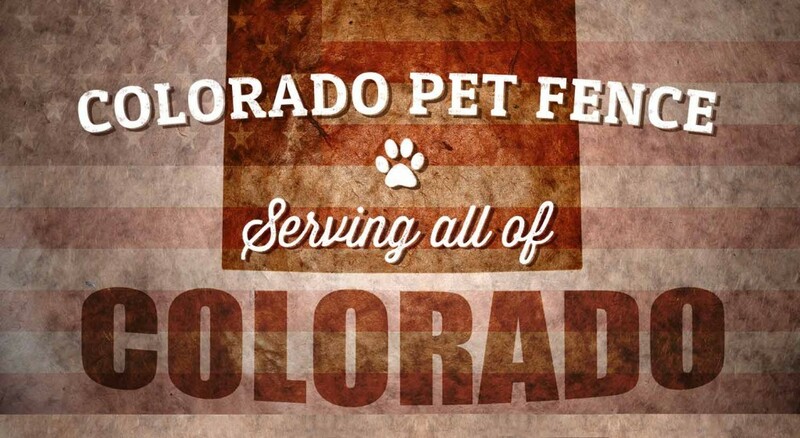 Why Choose Colorado Pet Fence? Colorado Pet Fence has the most comprehensive and longest guaranty in the industry. Our rechargeable collars save you lots of $$$ every year and are also more kind to the environment than rechargeable battery collars. All the companies in our area share the same basic technology that was invented by Invisible Fence® many years ago. Each has a good product and will help you keep your dog safe. We truly believe that each company operates with the well being of your pet as their top priority and each of them have an effective product. So, your choice comes down to finding a company that you trust and that offers you the best overall value. Colorado Pet Fence has the best guarantee in the industry and you save hundreds of dollars with our rechargeable collar system. We gladly repair systems installed by other companies. We carry a variety of different wire types and parts and can safely repair any brand. Are Your Costs the Same as Invisible Fence®? 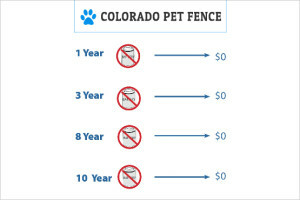 You WILL save money with Colorado Pet Fence. The most notable difference is our rechargeable collar with a lifetime warranty. Invisible Fence®, Petsafe® and Innotek® sell collars for their invisible fences that require battery replacement every 3-4 months. The cost can add up to hundreds of dollars each year – not to mention the hassle of shopping for them. 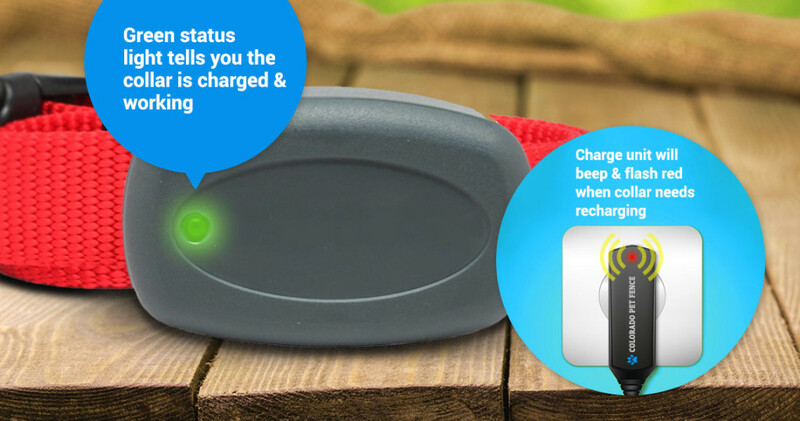 With our rechargeable collar you simply do not have that cost. Colorado Pet Fence is the LOWEST COST OF OWNERSHIP for invisible pet fences in Colorado. The winner is clear – hidden pet fences are a better solution than a traditional fence. A hidden fence is more versatile and significantly less expensive than traditional fencing. Maintenance on a hidden fence also pales in comparison to upkeep for a traditional fence. For purposes of keeping your dog or cat safe on your property, the invisible fence is the clear winner. Once a dog figures out how to climb under, get through, or jump over a traditional fence you have a serious problem. Whereas with the hidden pet fence, your pets are trained to stay exactly where they belong. The open views on your property that are allowed by the invisible fence are something both you and your animals can enjoy.